Gary A. Phillips returned to full-time teaching in 2015 after serving for eight years as Wabash’s Dean of the College (2006-2014). Before coming to Wabash, Prof. Phillips taught at the College of the Holy Cross and The University of the South: Sewanee, where he served as Department Chair and Director of Sewanee’s First Year Program (and also owned and operated a pizza restaurant and café). His current teaching and research interests focus upon the Bible and its relationship to Western art and culture, issues of violence and religion, and the ethics of reading and teaching the Bible after the Holocaust. Ethical questions related to interpreting the Bible in light of suffering and atrocity, past and present, are perennial concerns. 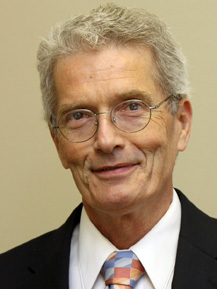 Prof. Phillips is the author, co-author, editor, or translator of eleven books and more than 70 articles. His most recent book focuses on the artwork of Holocaust survivor and painter Samuel Bak. Prof. Phillips has participated in the summer seminar of the United States Holocaust Memorial Museum’s Center for Advanced Holocaust Studies investigating the historical tie between anti-Semitism and Christian theology as well as offered workshops on pedagogical issues related to the teaching of the Holocaust. Convinced that a liberal arts education best prepares a person for wrestling with the central, most difficult human questions, Prof. Phillips is a first generation college graduate whose family came from the coal mine country of central West Virginia. His life was altered by liberal arts teachers who modeled the art of asking the question. His spouse, Alice Phillips, is the Program Coordinator for Secondary Licensure at Wabash. They are the proud parents of three adult children and two teenage grandsons. When not in the classroom, Prof. Phillips can be found cycling on the back roads of Montgomery County, visiting family in New York City, or installing ceramic tile. “Just Is After Atrocity: Lady Justice, Lex Talionis, and the Artwork of Samuel Bak.” Invited presentation to the Bible and Visual Culture section, Society of Biblical Literature International Meeting, Helsinki, Finland, August 1, 2018. “After The Postmodern Bible: Theory, Silences, and Other Barbarisms.” Invited presentation to the Deconstructive Poetics section of the European Association of Biblical Studies, Helsinki, Finland, August 2, 2018. “Justice and Just Is: The Art of Samuel Bak.” Invited Presentation at the Vilna Gaon State Jewish Museum, Vilnius, Lithuania, July 27, 2018. “Justice, Lex Talionis, and the Art of Samuel Bak.” Invited presentation to the Jewish Interpretation of the Bible Section, Society of Biblical Interpretation Annual Meeting, Boston, MA, November 20, 2017. “Fraught with Responsibility: Trauma-Informed Pedagogy, Teaching The Holocaust, and Biblical Texts of Terror in the Religious Studies and Theology Classroom.’ Invited presentation to the Biblical Literature and the Hermeneutics of Trauma Section, Society of Biblical Literature Annual Meeting, Atlanta, GA, November 22, 2015. “Eye for an I: Intertextuality, Lex Talionis, and the Call of Justice.” Invited presentation to the Intertextuality and New Testament Section, Society of Biblical Literature Annual Meeting, Atlanta, GA, November 21, 2015. “Representing the Irreparable: The Holocaust and the Art of Samuel Bak.” Invited presentation to the Jewish Studies Program of Kent State University. March 2-3, 2015. “Trauma, Pedagogy, and Teaching the Holocaust.” Invited workshop with Henry Knight at the Education and Research Divisions of The United States Holocaust Memorial Museum, Washington, D.C., February 3, 2015. “The Domain of the Dead and the Witness of the Liberal Arts.” The 30th Annual LaFollette Lecture. Wabash College, October 9, 2009. Watch on YouTube. Just Is in the Art of Samuel Bak. Boston: Syracuse University Press/ Pucker Art Publications, 2018. “Icons of Just Is: Justice, Suffering and the Artwork of Samuel Bak.” Religions 8, no. 6: 108. Available online: http://www.mdpi.com/2077-1444/8/6/108. “The Commanding Faces of Biblical Narrative.” The Oxford Handbook on Biblical Narrative. Ed. Danna Nolan Fewell. New York: Oxford University Press, 2017. "'Eye for an I.' An Intertextual Reading of Matthew 5:38 and the Artwork of Samuel Bak" The Press of the Text: Biblical Studies in Honor of James W. Voelz. Eugene, OR: Wipf and Stock, 2017. “The Icons of Just-Is.” Exhibition Catalogue Essay. Just-Is: New Works by Samuel Bak. Pucker Gallery, Boston, MA. October 18-November 30, 2016. “Textual Instability and Responsible Reading: A Poststructural Approach to Matthean Intertextuality.” Exploring Intertextuality: Diverse Strategies for the New Testament Use of Texts. Eds. B. J. Oropeza and Steve Moyise. Eugene: Cascade, 2016. “More is Needed: Mary and Martha, Levinas, and Indelibly Ethical Reading.” Signs and Gospels. Festschrift in Honor of George Aichele. Ed. Melissa Stewart. Sheffield: Sheffield Academic Press, 2015. Icon of Loss: The Haunting Child of Samuel Bak. Co-author with Danna Nolan Fewell. Boston: Pucker Art Publication/Syracuse University Press, 2009. Representing the Irreparable: The Shoah, the Bible, and the Art of Samuel Bak. Co-edited with Danna Nolan Fewell and Yvonne Sherwood. Boston: Pucker Art Publication/Syracuse University Press, 2008.